VFL: Round 14 win in 60 seconds Get a snapshot of the VFL Magpies' 41-point win over Frankston in 60 seconds with Collingwood Media. Darcy Moore played forward and kicked two fourth-quarter goals for the VFL Magpies against Frankston. Photo: Shane Barrie. There was bongo drums, face painting and the greatest hits of Queen blaring from the speakers any time the game clock wasn’t ticking. And just when you thought that was enough madness, the on-field action featured Dolphins, Magpies and a guy called Moose. While it may have been a lob-sided match-up on paper, there was nothing routine about Collingwood’s 41-point victory over bottom-placed Frankston at Frankston Oval on Sunday. The VFL Magpies led all day, but it didn’t stop the players and coaches letting out a sigh of relief when the final siren sounded. “We haven’t won down here for a while so it was good to get the result,” Collingwood development coach Tarkyn Lockyer told Collingwood Media post game. “It’s a really good atmosphere with the music at the breaks and the drums. The supporters do a great job of getting behind their team, so it’s always a challenge to come down here. Defender Matt Scharenberg agreed, describing the atmosphere as “hostile”. “It was definitely touched on by Taps (coach Dale Tapping). He said that they’ve got the better of us the last couple of times we’ve played," Scharenberg told Collingwood Media. “Especially out here as well, it’s always tough to score in this environment. If they were feeling unwelcome, the Magpies certainly didn’t show it in an entertaining first term. In dry and sunny conditions, the visitors piled on seven first-term goals to open up a 29-point quarter time lead. Lockyer believes the opening signs were notably impressive after the Magpies final quarter capitulation against Footscray last weekend. “We finished the game pretty poorly last week so the emphasis today was on starting well,” he said. This consolidation came in the form of a 19-goal, four quarter performance. Frankston won the third term with a five-goal-to-three effort, yet were never able to subside the 47-point margin Collingwood held at quarter time. The 19.9 (123) the Magpies kicked was the side’s highest tally of the year, surpassing the totals scored against Coburg and Werribee (both 121) earlier in the year. Four of today’s goals belonged to 199cm forward Ash Close who was wearing the black and white stripes for just the second time. Known affectionately as ‘Moose’ to his teammates, Close’s performance impressed his assistant coach and a man he last year won a premiership alongside for Morwell in the Gippsland Football League. “Ash has been around the place for a little bit. He’s done some work for us in our footy analysis department,” Lockyer explained. Fellow VFL-listed forward Scott Greenhough kicked four majors, while Darcy Moore was Collingwood’s only other multiple goalkicker with two goals in the final term. With AFL spots up for grabs ahead of next week’s clash against the Western Bulldogs, Lockyer believes today’s victory was the perfect opportunity for players to put their hands up for selection. “I thought a lot of the guys performed reasonably well. “Sammy Dwyer was good. Down back Jono Marsh has had a pretty good season and I think Matty Scharenberg was okay as well. Patty Karnezis was workmanlike which was terrific. And Darcy Moore gave us a couple of really strong contests. 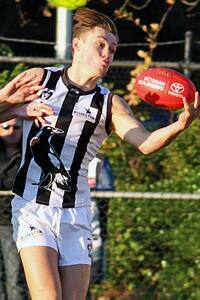 At a VFL level, the Magpies will return home to Victoria Park next Sunday to take on Casey.